Available Colors: Translucent: Blue or Red. Solid: Black or White. Shipping Weight: Poly Bag, 50 per carton @ 6 lbs. 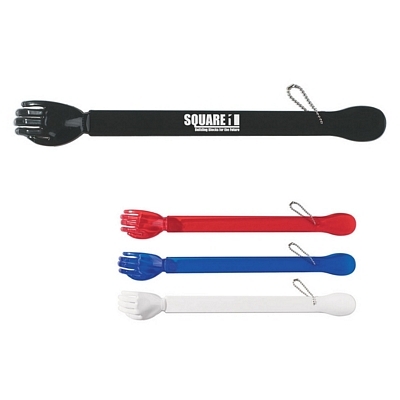 Customized Back Scratcher With Shoe Horn (Item #HT-9404) is Promotional with a Free Artwork Imprint. Promotional Back Scratchers like our Personalized Back Scratcher With Shoe Horn are decorated with your logo with no setup fees. Customized Star Shape Massager Item #HT-9405 (Minimum Order: 250). 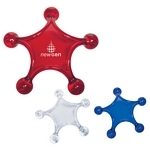 Promotional Massagers like the Star Shape Massager can be personalized with your business logo and with No Setup Fees. 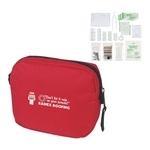 Customized First Aid Kit Red Pouch Item #HT-9421 (Minimum Order: 100). Promotional First Aid Kits like the First Aid Kit Red Pouch can be personalized with your business logo and with No Setup Fees. 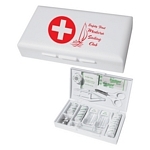 Customized Large First Aid Medical Box Item #HT-9422 (Minimum Order: 100). Promotional First Aid Kits like the Large First Aid Medical Box can be personalized with your business logo and with No Setup Fees. 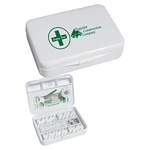 Customized Small First Aid Medical Box Item #HT-9423 (Minimum Order: 100). Promotional First Aid Kits like the Small First Aid Medical Box can be personalized with your business logo and with No Setup Fees.